The original title in Italian is Ladri di biclette and I’ve seen it translated different ways namely Bicycle Thieves or The Bicycle Thief. Personally, the latter seems more powerful because it develops the ambiguity of the film right in the title. It’s only until later when all the implications truly sink in. Vittorio De Sica’s film is unequivocally emblematic of the neorealist movement.The most notable traits are the images taken straight off the streets of Rome, depressed and forlorn as they are. The setting truly does act as another character, adding a depth to the film that cannot be fabricated. You can’t fake some of these scenes either whether it’s Antonio scavenging for his bike in the pouring rain or the sheer mass of humanity that is found in places like the Piazza Vittorio. It’s all there out in the open, with an apparent authenticity. In its simplicity, it feels like a real story with real people. This too is aided by De Sica casting non-actors in the main roles. In fact, Lamberto Maggiorani’s gaunt face is somewhat unremarkable (sharing some resemblance to Robert Duvall). Put him next to a poster of Rita Hayworth and it becomes even more evident. Still, he too feels human in a way that Hollywood stars just cannot quite pull off. It’s easy to believe him and invest in his story. The same goes for his young son Bruno. He’s one of the cutest precocious kids you’ve ever seen, reminiscent of Jackie Coogan in Chaplin’s The Kid. But it’s also his point of view that makes this film even more tragic later on. This father-son relationship has weight to it. And that makes Antonio’s dilemma that much more perturbing and ultimately so traumatic for the audience. De Sica’s film is so humble and yet its depths are ripe with so many universal truths and moments of sincerity. Here is a man trying to provide for his family. His wife, his son, and his baby. Work is hard to come by in the post-war years. Any opportunity is a good one and Antonio gets that. But he needs a bike. His wife sacrifices her sheets so he can get his bike — so he can maintain their whole livelihood as a family. That’s why it’s so crushing. Everything hangs in the balance of this unfortunate but seemingly mundane event. When Antonio’s bike is stolen it truly means tragedy because there is no lifeline, no direction to turn. And he does his best to recover his stolen property. Going to the authorities, rounding up his friends to search for it, even tracking down the boy who undoubtedly nicked his bike, but none of it leads to a successful conclusion. Another day finished with no hope for tomorrow, no money to bring home to his family so they can eat and live. He’s got nothing — a reality that’s made painfully obvious when he and Bruno sit down for dinner at a restaurant. They eat a meager meal as those just behind them gorge on a full buffet of courses. Bruno eyes them longingly and his father tries to lift his spirits, secretly knowing that he can never offer that to his boy. It puts his lot into a jarring perspective, suggesting the state of the affairs in Italy. But what makes the Bicycle Thief truly timeless is not its scope or what it says on a grand, majestic scale. It’s an intimate film and perhaps the most personal story ever put to film. In a matter of a few moments, it says more with the moral dilemma of Antonio than many lesser films conjure up in a couple hours. And because this is not a Classical Hollywood film, it does not sell out to its audience. There is no obligation to the viewer to keep them from being downtrodden — because that might rub them the wrong way and actually evoke a searing response. 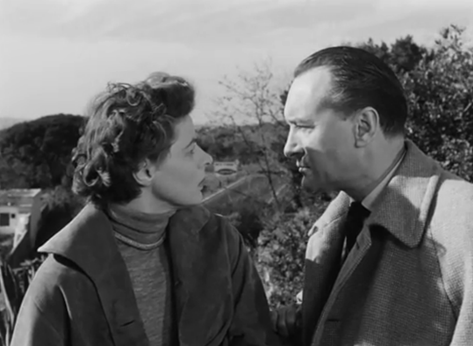 But there can be beauty in that and De Sica’s film is certainly beautiful for precisely those reasons. It feels real, it feels honest, and rather than sugar coating the world, it draws up a reality that is almost as old as the world itself. So yes, this film is so-called “Neorealist” and yes, it most certainly makes good use of its contemporary setting of Rome in the 1940s. But if any film can claim timelessness Bicycle Thief might just be the best bet because at its core are the type of issues that are not unique to time, space, language, or any other man-made barrier. Every person knows what it means to steal — to battle with their conscience — upending the moral framework that guides their lives. That hasn’t changed even if the context has and that makes The Bicycle Thief continually relevant. It ambushes us with the same emotional wallop each and every time. I mentioned Chaplin before briefly, but it didn’t occur to me until some time later that we leave our characters walking off into the sunset rather like Chaplin’s Little Tramp, except it’s a very sad sunset indeed. John Donne is noted for writing that no man is an island, but if this film is any indication, there might be a need to qualify that statement to suggest that some women are islands — at least when portrayed by the elegiac Monica Vitti. Red Desert begins with blurred images and a high-pitched piercing melody playing over the credits. From its opening moments, two things are evident. It gives off the general sense of industry and it features one of the most extraordinary uses of color ever with the blues and grays contrasting sharply with the brighter pigments. In fact, it’s oftentimes easy to think of Michelangelo Antonioni as a filmmaker well-versed in the poetic imagery of black and white but you have only to see Monica Vitti in her green coat standing with her son like two solitary beacons, to know that he is equally fit for color. He is a master equally skilled with a new palette. You could make the assumption that the world has become a sort of wasteland. More comic depictions of these themes are obvious in the works of Chaplin and Tati. In my own mind, a bit of Modern Times and Playtime began to float to the fore. There were bits and pieces of those films that felt like they could be analogous to what Antonioni is trying to accomplish here with his images of the industrial Ravenna. There are smokestacks, bells, whistles, factories, machines and so on. It’s easy to quickly surmise that this is all a condemnation of the world slowly going to hell because there’s no doubt that many of the opening visuals are bland and austere. But underlying Red Desert is a stark beauty that permeates the entire landscape. 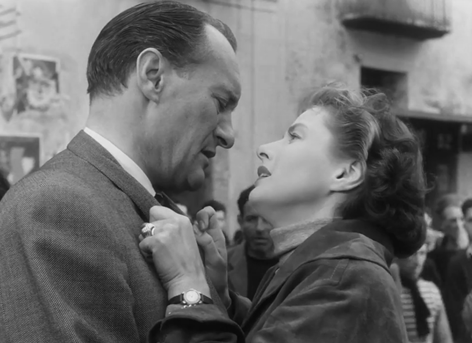 Thus, Antonioni’s perspective is perhaps a lot more nuance that the viewer will even acknowledge at first. However, even if this word does reflect its share of beauty, it is Monica Vitti’s character who still embodies paranoia and disorientation with the modern civilization. In other words, she is the one out of step with the contemporary world that she finds herself in, due in part to an auto accident and a subsequent stint in a hospital. She is struggling to readjust to reality. And it’s no wonder that Antonioni made a string of four films with her because she has a remarkable gift at personifying all that is distant and aloof in a human being, while still bearing immense powers of attraction. In this case, it’s the visiting recruiter (Richard Harris) who is taken with her. But not even a fling with him can remedy what she is struggling through. There’s no one who can fully understand her, not even the audience. As per usual with Antonioni, his film invariably feels to be altogether more preoccupied with form over content and that’s what is most interesting. It’s fascinating some of the environments he develops. Atmospheres full of billowing fog, wispy trees, stark alleyways, gridiron structures and all the while the color red pops in every sequence. There’s no score in the typical sense, instead, the dialogue is backed by foghorns, machinery, and an occasional electronic sound effect. We get a little better understanding of her psyche when he recounts a mesmerizing story to her young son about a young girl who spends her afternoons swimming in the glassy water off the coast of an immaculate island. The pantheistic fantasy she so vividly paints for him is strikingly juxtaposed with the world around her — a world she has yet to feel fully comfortable in. However, both worlds somehow seem empty. When it comes to being aloof, apathetic, and distant Monica Vitti knew no equal, and she works so marvelously against the worlds that Michelangelo Antonioni creates. Her sultry pair of eyes speaks volumes as far as sensuality and charm — making words hardly necessary. When we look at her and how she moves so indifferently through this romantic space with her former lover, it becomes all too obvious. There’s no feeling there. There’s no magic left to be tapped into. That happens with love sometimes, and it’s excruciatingly painful, even to watch. In these opening minutes, nothing is said yet it’s hardly boring. There’s something tantalizing about sitting and waiting for some piece of exposition to come our way. 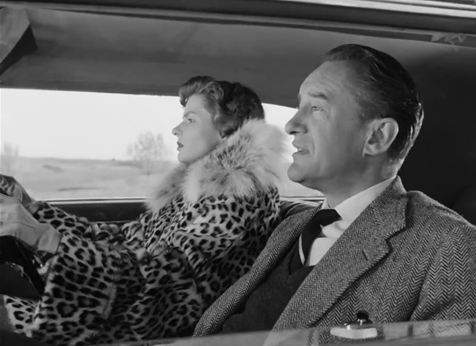 Besides Antonioni’s extended shot length, a steadily smooth camera, use of mirrors, and a wonderful manipulation of the interior space to frame shots keep us constantly engaged. The initial scene in the stock exchange is gloriously tumultuous and it never lets up. This is the dashing young Piero’s (Alain Delon) domain that he rushes through with lithe business savvy. What this arena becomes is the quintessential Italian marketplace, a hectic theater of business made up of all kinds, involved parties and observers alike. Vittoria (Vitti) is one of those who looks on with mild interest and really throughout the entire film she is a keen observer as much as she is a person of action. Through the mutual connection of her distraught mother, she and Piero become acquaintances. No more, no less. But we expect there to be more, because how could you waste stars like Vitti and Delon without at least a few romantic interludes? But we are made to wait patiently as they share a little contact, watch the extraction of Piero’s car from its underwater mortuary, and take a long walk. Again, Antonioni continues with glorious panoramas, a meticulous framing of shots, and exquisite overall composition of mise-en-scene. It makes every image that comes onscreen hold merit and they stay onscreen certainly long enough for you to truly appreciate them. He’s audacious enough not to feel the need to have his figures centered in the frame, and he dances around them, placing them really wherever he pleases, but there’s still something strangely satisfying about it. Doorways, trees, pillars, heads all work nicely. And the narrative becomes perhaps even more tantalizing than love because it’s the prospect of romance that keeps it going. But it never seems fully realized. It’s frustrating, unfulfilling in a sense, like most of his films. Whether it’s an unsolved mystery or the most perplexing conundrum mankind has ever faced romantic attraction, he always leaves us an open-ended denouement. There are laughs and moments of immense satisfaction, but they are transient — invariably lasting for only a very brief instant. In fact, this film’s finale is a dour twist that submerges L’Eclisse even lower than we could ever expect. With a title such as “Eclipse,” there’s a potential for foresight, but there also are very few warning signs. Then, all of a sudden, we are privy to a newspaper dotted with headlines like “nuclear arms race” and “fragile peace.” That is all. It’s in these final moments that L’Eclisse takes a far more haunting turn than Dr. Strangelove and any of its compatriots. It just stops. No explanation. Not even a sign of our protagonists. Again, it’s that maddening ambiguity that comes with waiting out this lull. But the ultimate joke is that there is nothing after the lull. The frame literally gets darker and quieter and then everything ends altogether. There is nothing more. Enveloped in darkness, it simply ceases to be, another enigmatic visual tour de force from one of Italy’s most fascinating titans. I had never seen anything from Bernardo Bertolucci, but a few of his other films that came to mind were Last Tango in Paris and 1900. I was expecting some mix of The Godfather and Le Samourai set in Italy during the 1930s. In all honesty, those were the meager reference point I was going into this film with. In some respects, it felt like my first time with The Leopard or The Battle of Algiers, because I thoroughly enjoyed the films, but the history and backstory really eluded me. Not knowing the ins and outs, what was fictitious or what was reality, I was forced to strip it down. So even if I could not track with everything, I could appreciate it as a piece of cinema trying to paint a picture of a certain time and place. 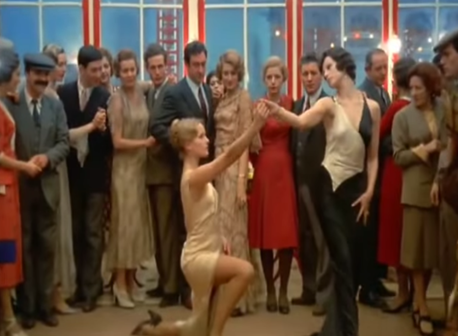 That’s what Bernardo Bertolucci and his cinematographer Vittorio Storaro do so well, and it turns The Conformist into a visual delight. It can stand on that merit alone, depicting gray facades that are only an outer shell for beautifully stylish interiors, flooded with light and infused with colors and textures. The drawing rooms are luxurious and Paris and Rome become the perfect backdrop for a world that vacillates between the bleak and the decadent. It’s the clean modernization of this fascist society intermingled with the ways of old. Storaro on his part, even makes leaves compelling and a man walking down the street becomes fascinating with dutch angles and contorted perspectives. That’s just the visual side of this film. 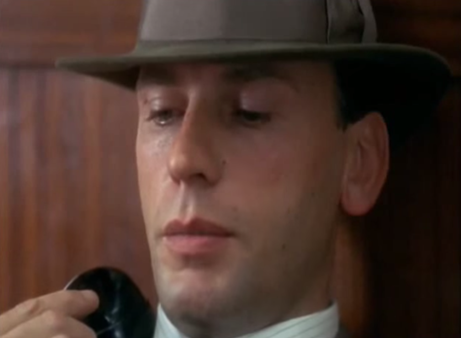 The Conformist, at its core, is a character study of one man, Marcello Clerici (Jean-Louis Trintignant), who is trying to find normalcy in a 1930s Italian world that is dictated by fascism. He’s a member of the secret police, who is assigned to knock off a political dissident seeking asylum in France. The target turns out to be one of his former professors so that in itself begins a personal conflict. There is a constant clashing of the state and duty with family and kinship. But within this main objective which drives the entire story and eventually takes Marcello from Rome to Paris, there is also a lot of personal baggage to be parsed through. Although Marcello is pursuing the professor with his comrade Manganiello, a barrage of flashbacks cast some light on the rest of his life. It develops the framework for this man, what he does, and why he does it. His mother lives in their crumbling family mansion contenting herself with the companionship of her Japanese chauffeur “Tree.” Marcello’s father is locked away in an asylum. That is his family of origin and even going back to his childhood, he was traumatized and sexually abused. Now, in the present, he tries to conduct a normal lifestyle with his fiancee Giulia (Stefania Sandrelli), but when he goes to confession on her prompting, we realize how hardened he has become. His family does not seem all that important to him and religion is little more than a social structure. And when he finally travels to Paris with Giulia, to meet with his old professor and complete his objective, that task gets complicated when he sees Anna (Dominique Sanda). Whether they know each other from before or not is ambiguous, but what’s not ambiguous are his advances towards her. It’s another weird, twisted dynamic because she knows that he is a fascist, and Marcello knows he will soon enough have to kill her husband. His wife and Quadri’s wife get along quite well. There is no animosity there, just like there seems to be no visible animosity between Marcello and his former teacher. Murder should not enter this equation just as adultery doesn’t seem logical. Marcello even has his doubts, but again relationships, love, and family all take a back seat to the cause, just as he takes a back seat and lets everything run their course. But he cannot maintain his perfect veneer forever. There has to be a breaking point somewhere and so there is. With the fall of Mussolini, no one wants a conformist and Marcello is stuck in this gray area. In The Godfather, since they are in America, at least they have some corrupted notion of family and religious faith. They accept capitalism although they work outside of it at times. But in The Conformist, although Marcello likes the idea of family, he really does not desire it. He falls for another woman in lieu of his wife, and yet that woman is of little concern to him when it comes to the agenda of the state. He looks for normalcy and maybe he gets it in a sense, but underneath it lies so much pain, dirt, and corruption. Just look at Marcello. He’s a repressed, misogynistic, faithless, fascist conformist. We expect him to be like Le Samourai, and he can’t even pull a trigger with confidence. He’s a pitiful, messed-up man who has been riddled with fascism. It didn’t kill him, but it might as well have. Vittor io De Sica is at the forefront of Europe’s most accessible filmmakers of the 20th century and that’s because the stories he crafts are heartfelt, moving, and also enter comical territory with ease. Sunflower pairs him once again with two of Italy’s Titans Sophia Loren and Marcello Mastroianni, and as you would expect the film starts off full of passion, playfulness, and a little pasta. It’s the dawn of WWII and the frisky pair is in love, deciding to get a quick marriage so they might get a 12 day leave before Antonio has to ship out. In a sense, this is a kind of war film, because Anto gets sent off to the Russian Front and we get a glimpse of the harsh realities there. We are treated to some newsreel style war footage all the while veiled with a billowing red flag. Sunflower is not a film about the politics of the war per se, but rather the effect that war has on people and their relationships. It can heighten passion, tear people apart, and change lives for good. 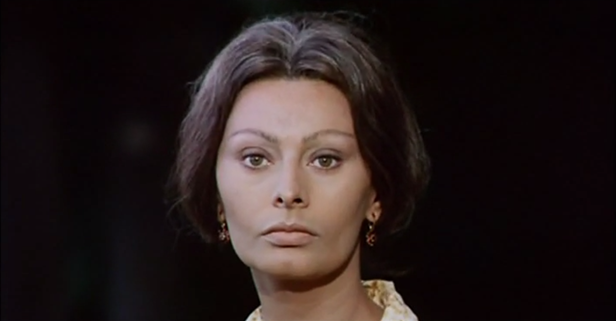 When the news comes home that the war is over, there is a flood of relief and then everyone including Giovanna (Sophia Loren) frantically begins the search for their kith and kin. Worried mothers and wives bring their long-cherished photos into train stations clinging to the hope that just one person passing by will be able to give them some fragment of hope. That’s what Giovanni gets and it’s not much, but a jaded soldier who suffered alongside Anto tells her the last time they were together, he was freezing to death in the snow. Her first reaction is to berate him, but he’s too tired to care by now. So she prepares for the journey to Russia to find the whereabouts of her long-lost love. She will not take no for an answer, but what she finds is more painful than even she could expect. It’s a different type of scar, a different type of hurt that no one could foresee. In some respects, Sunflower feels like a precursor to Life is Beautiful (1997), because both films are full of hopefulness, but they both exist as heart-wrenching stories. They deliver the same moving swells of emotion, but for different reasons. Sunflower ends up feeling a little like Umbrellas of Cherbourg in its tragedy. But the title seems to suggest, maybe, just maybe, like the old adage says, out of the ashes beauty can still rise. All the pain and suffering are only the fertilizer for flowers to spring up from the desolated earth. A memorial of what has happened, but also a harbinger for the future. This is truly an international film because although it’s in Italian, it was partially shot in Russia (a first for the USSR) and features Russian performer Lyudmila Savelyeva in a prominent role. But the lovely score comes courtesy of America’s own Henry Mancini, rounding out this film perfectly. It’s another pleasant surprise from Vittorio De Sica. 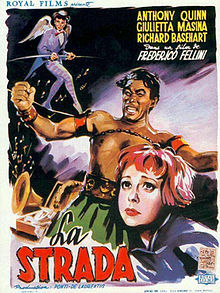 Federico Fellini’s La Strada is in the tradition of other films like Chaplin’s The Circus (1928) and even Nightmare Alley (1947). He even goes so far as to feature two regular Hollywood performers in Anthony Quinn and Richard Basehart. This film is prominent for helping the Italian master achieve mainstream success, and it functions as a sort of crossroads. It still has one foot planted in a neorealist world with the other slowly entering a world of whimsy. It also suffered a production schedule that was as plagued with problems as the characters depicted therein. The plot itself is relatively straightforward following a volatile strongman (Quinn) who buys a shy young woman off her mother to travel from town to town with him. He’s a real entertainer, and he teaches her most of what he knows so she can assist in the act. However, when they’re not working together, and the show is done, he goes right back to treating her badly and making life quite miserable for her. Zampano’s not the understanding sort. Giulietta Masina has a starry-eyed quizzical face that elicits not so much a negative response, but one of perplexment. It’s the perfect visage for say a clown (which she masquerades as) since it can be so jovial and in the same instant sad and somehow distant. As her life on the road progresses she finally forgets loyalty and goes on her own to get away from Zampano’s abuse. While being alone she comes across the performance of a skilled acrobat (Richard Basehart) and what follows is a rocky partnership in a rat tag act that once again includes the strongman. But the constant heckling and joking of “The Fool” gets on Zampano’s nerves until things start to get violent. Once he gets out of prison for his behavior, he and Gelsomina get back together, but a run-in once more with his old nemesis turns out badly. This time all the wind is taken out of her sails after what happens. She is a mime without any emotion, hardly any life left in her. One night Zampano leaves her behind in the night never to see or hear from her again. His existence from then on is as dismal as Gelsomina’s outcome. Fellini himself suggested that La Strada was a very personal film, and it brings into question if he had a bit of Zampano and Gelsomina inside himself. La Strada also lacks the excess of his later films, instead contenting itself with simple roads and humble people — a stream of beautifully austere images without much extravagance. Also, with the character of Gelsomina comes a wistfulness that drives the tone of the film. As she contemplates with “The Fool,” everything must have a purpose, because if even a pebble has no purpose then everything is pointless. It’s in many ways a dismally bleak film, but still enduringly interesting. I’m not well versed in Spaghetti Westerns, but I certainly do not need someone to tell me that Sergio Leone’s film is a sprawling epic. That’s an understatement if there ever was one. The cast, the score, the visuals. Everything about it fits together so marvelously. All the moving parts succeed in developing a majestic piece of cinema that really is awesome. I try not to use that word lightly. Recently I saw Tarantino’s Django Unchained which of course pays homage to the Spaghetti Western, and it undoubtedly exhibits the Tarantino style. However, Leone’s film lingers as well, but with Once Upon a Time in the West, I didn’t mind. The film, after all, has a cold open that lasts 13 minutes and most of it is spent staring at Jack Elam and Woody Strode. Except the way Leone captures it all, I don’t really mind. In fact, I thoroughly enjoy it. Whereas Tarantino’s film felt like it was dawdling, Leone’s film didn’t seem to dawdle. It was just stylish in its makeup. The pacing at times feels like a lazy Sunday afternoon underlined by dread for something to come. Then for a brief blip, the trouble comes violently and then just like that it’s gone. Everything’s back to the status quo except this structure makes every killing and gunfight seem all the more dynamic. 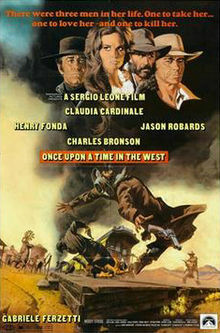 The main players are Claudia Cardinale, James Bronson, Jason Robards, and Henry Fonda. Cardinale, of course, is one of the icons of cinema, and here she feels like a wonderful embodiment of this woman who helps bring civility to this land. Whether it’s simply her immense beauty or some emotion behind her eyes, it’s hard not to watch her every movement. First, as she learns she is a widow, next when she is introduced to the other main players, and finally when she sees her dead’s husband’s dreams forming all around her. James Bronson as the aloof, but deadly “Harmonica” has to be at his coolest. He hardly has to say anything because that ominous harmonica music is his calling card. Every time we hear it we know he’s around and also his eyes are so expressive. Sergio Leone is never squeamish about lingering on his star’s faces. In fact, that paired with landscapes is one of his signatures that helps define his iconic style. The contrasts stand out and the interludes often lacking dialogue somehow help make his characters even cooler. They take on an air of mystery and in the case of “Harmonica”, we only understand his vendetta near the very end. It all starts to make sense. Robards is the outlaw Cheyenne, who is pinned with the murder of McBain’s wife and children. A posse is after him and his gang, but he was actually pinned for the rap. He is cast in the light of a scruffy anti-hero and Robards plays him rough around the edges, but most importantly with a heart. He’s one of the few characters who seems to get Jill. He knows enough that none of the men around her are worthy of her, because she is a special class of woman, in spite of what her past may say. Perhaps the most striking of casting choices was Henry Fonda because by now he was well along in his career and most certainly best known for his plain-speaking heroes. That’s what makes Frank such a great character because dressed in all black and armed with a revolver, he guns someone down the first moment we see him. It’s a shock and it sets the tone for the rest of the film. He goes on to backstab his sickly employer and continues to put pressure on Mrs. McBain to give up her land. It goes so far as taking advantage of her at her home. He’s a monster, but the part is such the antithesis of the Henry Fonda we know, making it a pure stroke of genius. At least for me, you soon forget about the dubbing of certain characters and just allow yourself to become fully engaged in the dynamic West as envisioned by Leone. After all, since there isn’t a whole lot a dialogue, in some scenes it loses its importance. It’s often about the desolately depicted visuals. The wry smile on a face. The buzz of a pestering fly or the squeaking of a windmill. That’s another thing. This film puts sound to use so wonderfully. Whether it’s the harmonica, Morricone’s engaging score, or diegetic sounds. In fact, the score evolves and reprises in concordance with the pacing of the film. It can be ominous. It can be playful. And sometimes it’s nonexistent. When it all comes down to it, we get the final showdown between “Harmonica” and Frank, but the film is a lot larger than that. After all, we have been following multiple characters. Jill finally sees the world around here coming to life, and she has weathered the Wild West as an independent woman. As for Cheyenne, he ends as a tragic hero of sorts. There’s no question, Leone’s film, arguably his greatest alongside The Good, The Bad, and The Ugly, helps define a version of the West, with iconic characterizations placed up against striking pictorials. It’s one of those film’s that despite the length, never feels like a labor. A smile is constantly forming on my face, to mirror the visage of James Bronson. I really wish I could play the harmonica now. It’s so ridiculously cool! That’s what I really took away from this film.